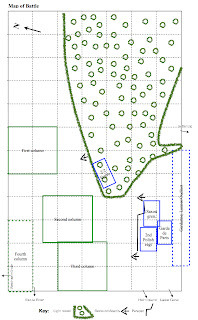 Map of the battlefield and initial dispositions. 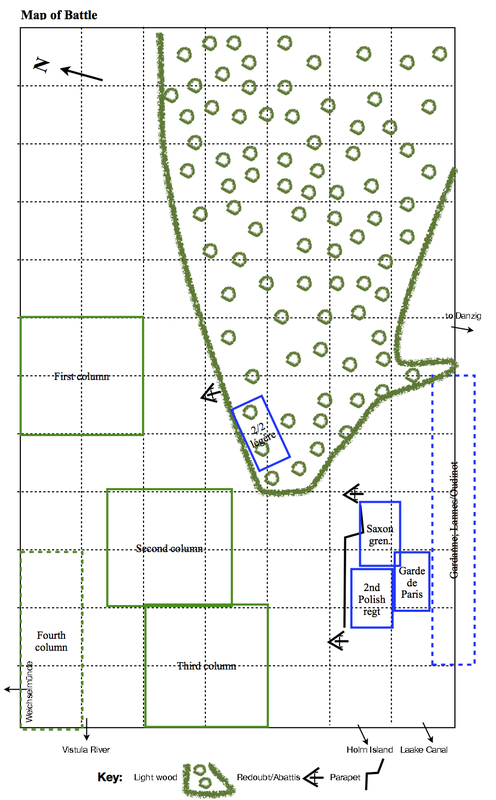 The Russian second and third columns (see map) began with a subtle frontal assault against Schramm’s defensive position behind parapet and redoubt (Photo 1)! As with the real battle, this attack was stopped dead in its tracks by small arms and artillery fire from the French, Polish and Saxon and defenders. This seemingly hopeless attack by the Russian infantry allowed the detachment of cossacks from the third column to work around the left flank of the French position (Photo 2). Thus positioned, the cossacks attacked and over-ran the left-flank French battery (Photo 3), but were stopped by a square of the Garde de Paris Infantry (Photo 4). What had seemed like a promising flank attack then faltered completely when the musketeer battalions supporting the cossacks were stopped by fire from the Garde de Paris and the first of the French reinforcements; Gardanne’s light infantry (Photo 5 & 6). 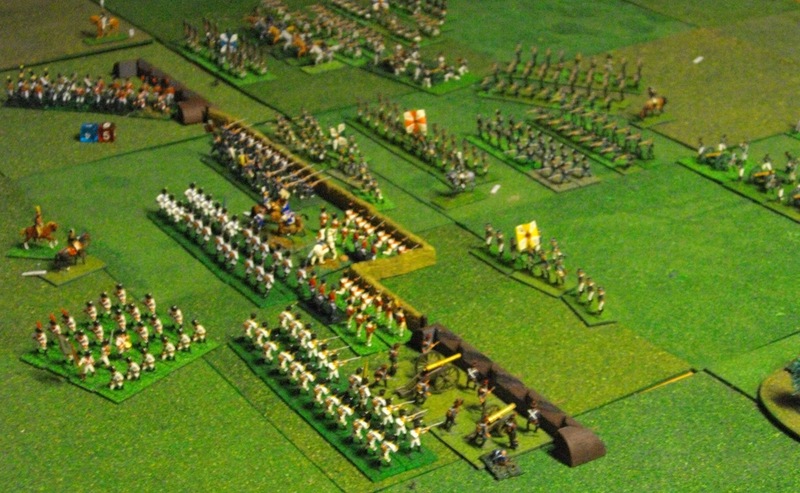 Photo 1: The attack by the Russian second and third columns. Photo 3: Gap opened in French line due to defeat of artillery by the cossacks. Photo 4: Prepare to receive cossacks: square of Garde de Paris with Gardanne's 2/12e légère approaching in support. Photo 5 & 6: Gardanne's 2/12e légère support the Garde de Paris to push back the Russian musketeers and grenadiers of the third column. Things were going much better for the Russian first column in its attack against the French right flank, which was defended by the 2/2e légère and a battery of foot artillery positioned behind an redoubt on the edge of the wood. 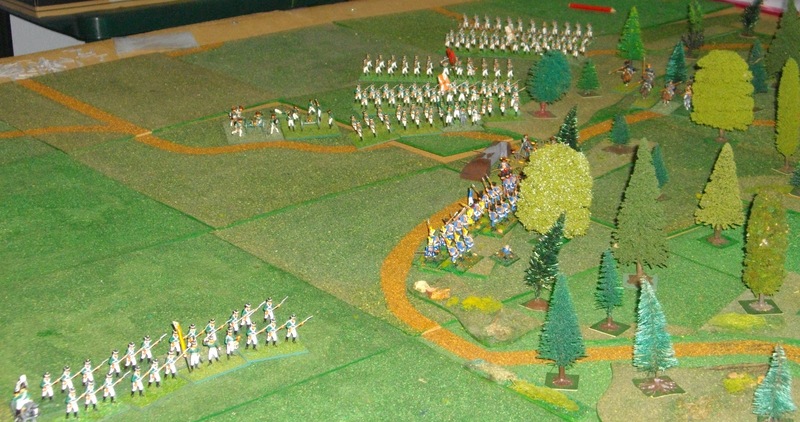 While the infantry advanced against the French position, the supporting cossacks worked through the woods and fell on the flank of the French position driving off first the artillery and then the 2/2 légère (Photo 7–10). Having thus cleared the wood, the first column advanced towards the main French position behind the parapet. Photo 7: The Russian first column attacking the French right flank. Photo 8 & 9: French artillery and 2/2e légère dispersed by cossack attack on the flank in support of the first column's infantry. Photo 10: Sauve qui peut! 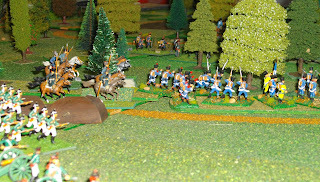 2/2e légère being run down by cossacks. Meanwhile, back on the left, the counter-attack by the Garde de Paris and Gardanne’s 1/12e légère had successfully beate back the musketeers and grenadiers from the Russian third column (Photo 11). With his attacks thus blunted, the arrival of Lannes and Oudinot with four fresh grenadier battalions decided the matter and the Russians called off the attack. Photo 11: At battle's end. The French remain in control of the parapet and redoubts, with Lannes and Oudinot's grenadiers approaching (out of picture, bottom left). 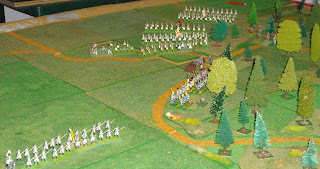 By the rules of the scenario, the game at that point was a draw (approaching a French minor victory), but the situation suggested that it was likely to turn worse for the Russians, thus reflecting the historical outcome, had the game continued. This was a good game and a useful scenario to use to play-test the General de Brigade rules. We re-fight the battle this week, swapping army commanders and using our Shako-ANF rules, so it will be interesting to see what the similarities and difference are. Hello, very nice Russian Army. Thanks Vitor. That is Mark's great brush-work.